SERVE M.E. NOW | Serving Magnificence & Excellence Now > Blog > [SMN] Recipes > How Do You Do Pasta? Our friends from Foodstand gave us a quick look at pasta just in time for National Pasta Day this Saturday, October 17th. They make a good point about the decline in its popularity due to the prevalence of lower carb, higher protein diets. Even our Private Cooking Classes show its #1 cooking class, Pasta Perfect, move to #3 just behind our Farm-To-Table and Easy Entertaining classes. So as a self-proclaimed pasta connoisseur, have at it this weekend. Go pasta crazy! There’s always Monday! 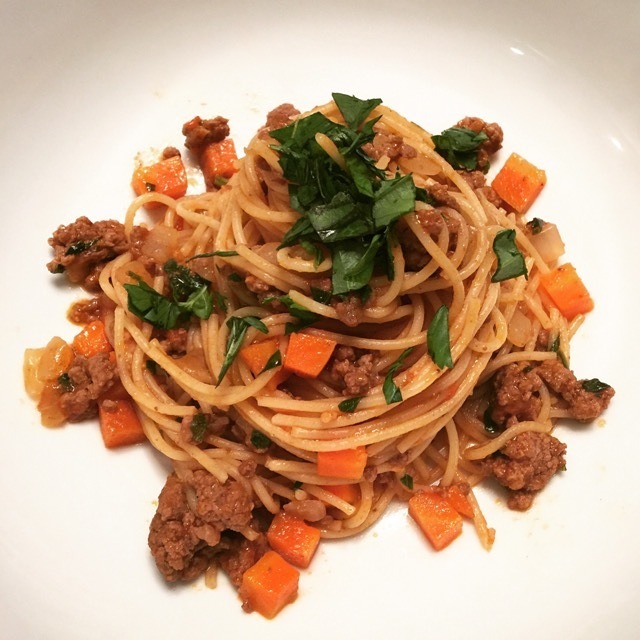 Here’s our recipe for the perfect meat sauce. I used a traditional dry pasta, Spaghetti in the following pic. As noted in the recipe, a true Bolognese should be served with flat, wide pasta such as Tagliatelle, Linguine, or Pappardelle. Check back in a few days and I’ll have my fresh Tagliatelle recipe up. Until then, enjoy! *TT means “To Taste” or season to your liking. In a large heavy bottom saucepan, sauté carrots, onions, celery, and garlic in olive oil on medium heat. Cook until soft and translucent. DO NOT BROWN! Add ground meat to vegetable mixture. Cook on high and stir frequently to break apart ground meat. Cook until properly browned. Once meat is cooked, add concasse tomatoes and sauté until softened. Then, add chopped whole peeled tomatoes, reserved liquid, red wine, and Italian seasoning. Simmer over low to medium heat for about 30 minutes or when liquid is reduced by half. Once ragu is reduced, take off of heat. Season with Kosher salt and black pepper to taste. Garnish with parmesan cheese and parsley. Serve with your favorite flat or wide pasta. Enjoy! Serve with 1 ½ # (uncooked) Tagliatelle, Pappardelle, or Linguine; cook as directed. You can substitute a mixture of ground meats such as beef, pork, and veal. Use any combination adding up to 2 ¼ # of ground meat.